« Where do we draw the line? What follows are the highlights of my visit with this class and their remarkable teacher. I hope you’ll feel the same sense of excitement and promise I felt when the bell rang at the end of the day. Act 1: Ways we Make Sense of and Talk About our World. Act 3: Taking it home. The word wall behind me was covered with words like producers, decomposers, invertebrates, habitat and more. Over time, I explained, we’ve come up with words to organize and make sense of our world. The words on their word wall are good for understand WHAT something is or what role it plays. 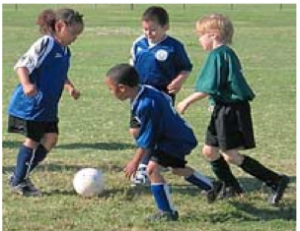 They are useful for categorizing and organizing. What if we want to understand WHY something changes, for instance: Why did the elk population explode, or get really, really big? Or why did the sea otter populations go down so much over the past two years? You can’t answer those questions focusing on the sea otter, or the moose alone. To answer that question you have to look at sea otters, for instance, in relation to the orcas, sea lions, herring, bald eagles, sea urchins, kelp forest, fishermen and more. What set of interrelationships might be influencing or driving the change we’re interested in? Ok. So the stage was set. If they wanted to know why things changed, they needed to understand the parts and be curious about the relationships between the parts. The relationship between parts. That matters. They got that. But why? 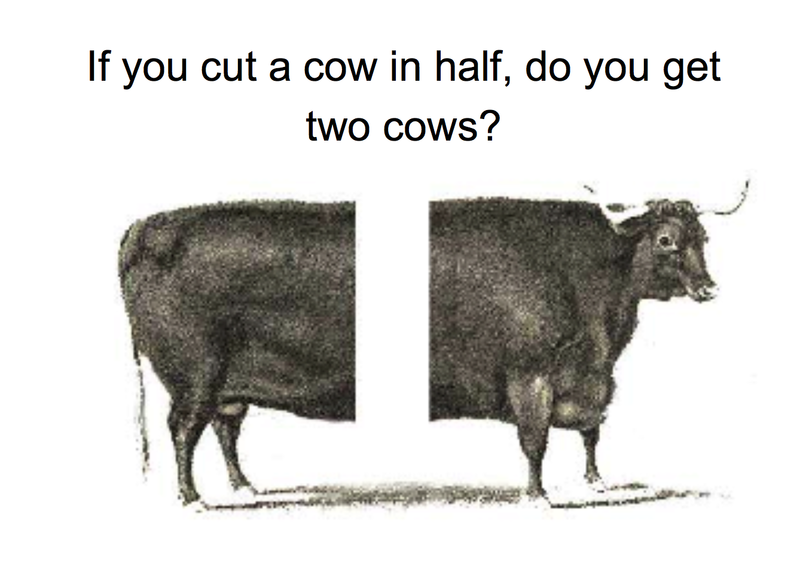 To get into that question, I asked the class: If you cut a cow in half, do you get two cows? They LOVED this because they ALL KNEW THE ANSWER. “OF course not! “ they shouted in unison, blissfully forgetting to raise their hands. Well, why not, I wondered. I congratulated them on how much they already knew about systems. I was struck by how much intuitive knowledge they had about but how few opportunities they had to put that intuitive systems understanding to use. 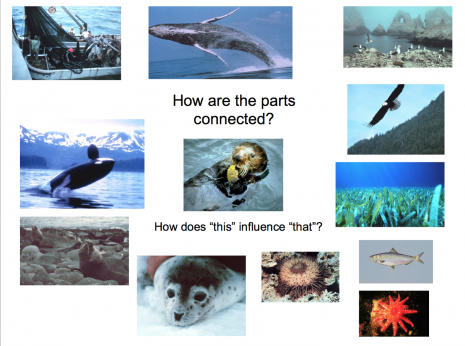 They now had a good idea that systems are sets of things – organs, animals, members of a family, students in a classroom, species in an ocean, whatever – that are interconnected in such a way that they produce their own behavior. We added the word “living” because unlike a mechanical system – like a car or computer – living systems change over time. 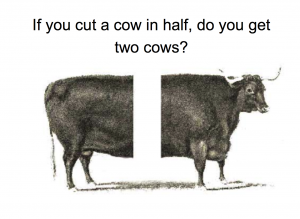 Having established that the cow can’t be cut in half because it was a system, we looked the difference between a heap (in this case, a pile of laundry) and the another system, the human body. (You can see a the PBS Learning Media version of that discussion here). Then we had a pop quiz (like this one), but with lots of colorful pictures. The best part of this discussion was their unanimous conclusion that a kindergarten soccer team was a heap, but a 4th grade soccer team was a system! As a quick reminder that “systems” is not a new idea, one of the students did a very spirited reading of a lesser known Aesop’s Fable, “The Belly and The Members.” Such silly idea for the hands and the mouth to starve the belly, right? Why? Because they’re all connected!! What happens to one part affects them all. To get a felt sense for the idea that “systems are made up interrelationships, (or sets of cause and effect relationships), we then played the What Good is a Wolf Game, a systems thinking playkit similar to this. 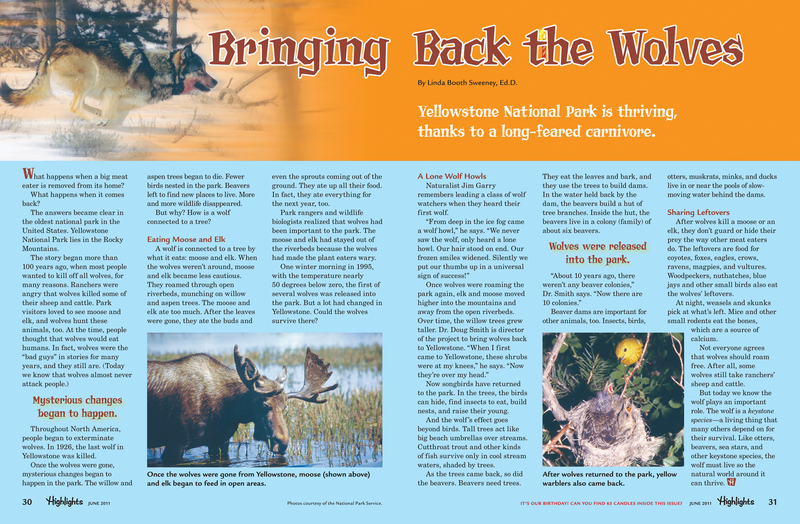 What happened after the wolves were removed from Yelllowstone in 1926? What happened when they were returned almost 70 year later? 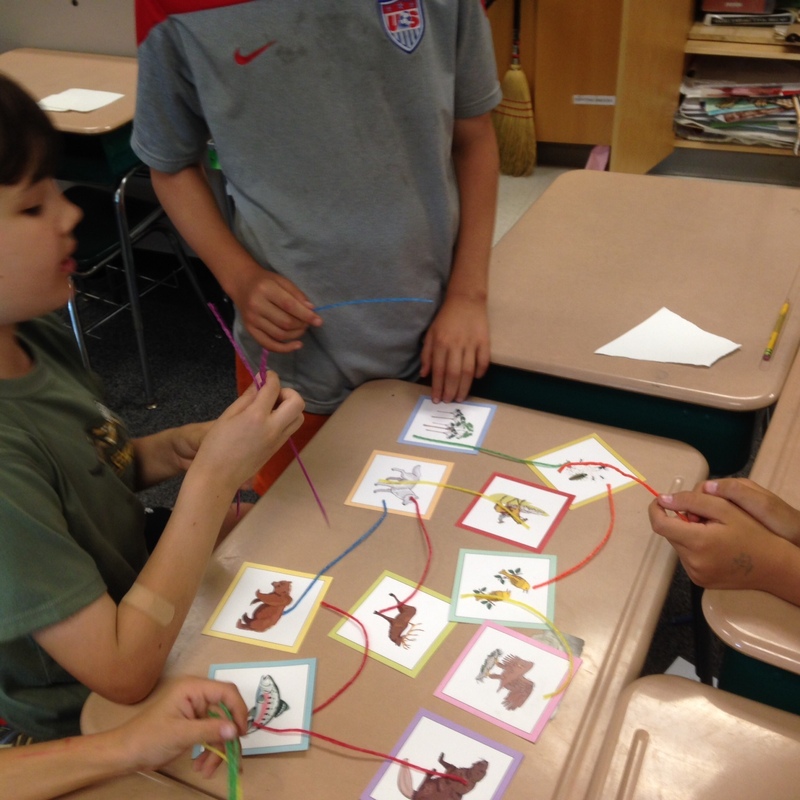 In groups of five, they explored “how this influences that” (or cause-and-effect) interrelationships among the wolf, elk, beaver, decomposers, yellow warblers, aspen trees, bald eagles, cut-throat trout, and ranchers. For a moment I wondered if the colorful, bendable wikki sticks would prove to be too much of a distraction, but after they were told they could each take home a few, they settled down on got to work. There was some necessary sorting out between food webs, where the links represent energy exchange, and causal loop diagrams, where the connections represent how more or less of this, for instance, wolves, effects “that’’ (for instance, the elk population). They poked and prodded, linked and unlinking the different cards, and in the process, all the groups eventually revealed a closed loop between the wolves and the elk. We talked about the two basic closed loops of interconnection that make up systems: balancing (as they saw in predator prey relationships) and reinforcing (as in population growth). 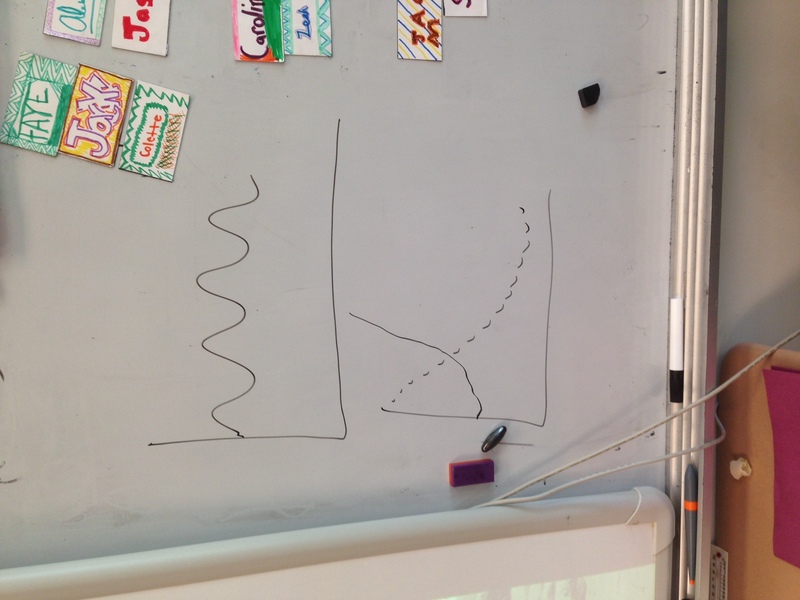 When I asked them to draw simple line graphs to show the changing behaviors in these causal loops, one fourth grade boy jumped out of his seat to show me what would happen in a closed birth/population loop (if there no major plagues or tragedies). What’s really interesting, is that these different kinds of systems share some similarities, and they can act in surprisingly similar ways. We talked about how we might see a pattern called escalation show up between two rival soda companies, and then read about a similar pattern of escalation between countries. Or the ups and downs they noticed in a predator prey relationship might be similar to the ups and downs the experiences with friends at school. Act 3: Act 3: Taking it home. To wrap up, we had one more pop quiz. 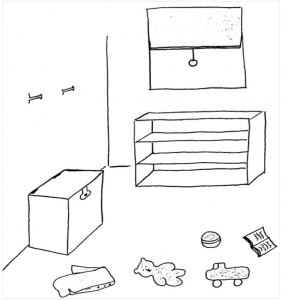 I showed them this picture (from Nancy Roberts) and asked: Has your room ever looked this like this? We talked about what happens next: Messy room à Mom unhappy — > Clean up Room à Mom happy. One little girl yelled out: But then my room gets messy again! 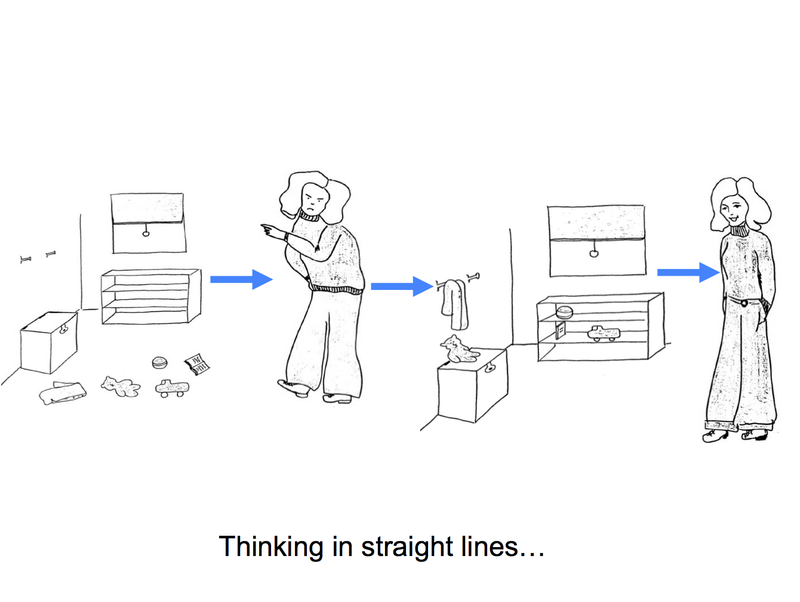 We talked about seeing situations or events in straight lines vs. closed loops. Sometimes, a straight line of a causes b doesn’t tell the whole story. 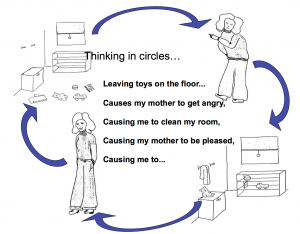 When we connect the dots and close the loop, we see an up-and-down pattern of happy/frustration, clean/messy. I encouraged the kids to created the loop with a parent at home, and then come up with a new way, based on the big picture. 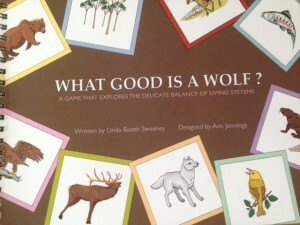 The wolf game helped the kids to see that patterns of connection that make up systems. We talked about other ways to make systems visible. 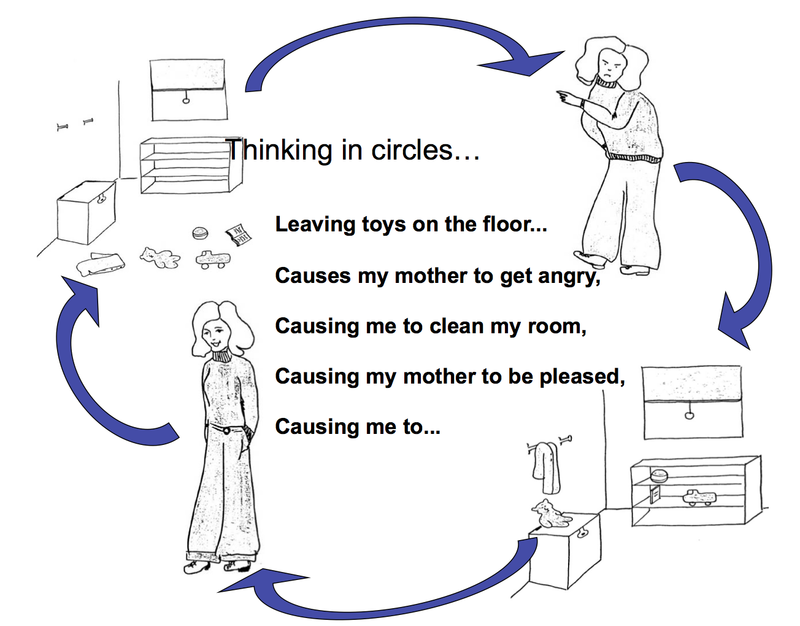 If we can learn to make these interconnections visible (on the back of a napkin, in a connection circle or causal loop diagram, in a complex systems model), we can better understand the system, we can understand the behaviors they produce, and in some instances, if we change the pattern of connection, we maybe even change them. We ended with a quick game of thumb wrestling to leave them with the thought if they can see interconnections, they can work with them better. Just as they were about to leave, a group standing near the turtles exploded with the excitement: “Toast is eating the snail!” “She’s the predator, like the wolf…” and “… snail was the prey.” The timing couldn’t have been more perfect. All that in an hour with a fire alarm thrown in for good measure. 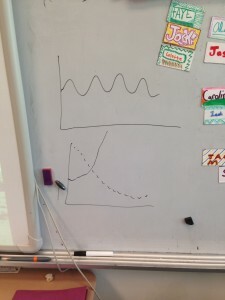 As I debriefed with the teacher at the end of the day, she was excited by the connection she saw between the systems conversation and her graphing unit in math the following week. She got how the study of systems could her her students to bridge the disciplinary boundaries of her classes. I’ll be pointing her to the CLE’s Shape of Change, resources on the Waters Foundation website and PBS Learning Media’s systems literacy pilot. She’s already talking about ways to bring “systems” in more explicitly to all of the fourth grade classes. School-wide support is needed and there are other hurdles but for now, this is good grogress. 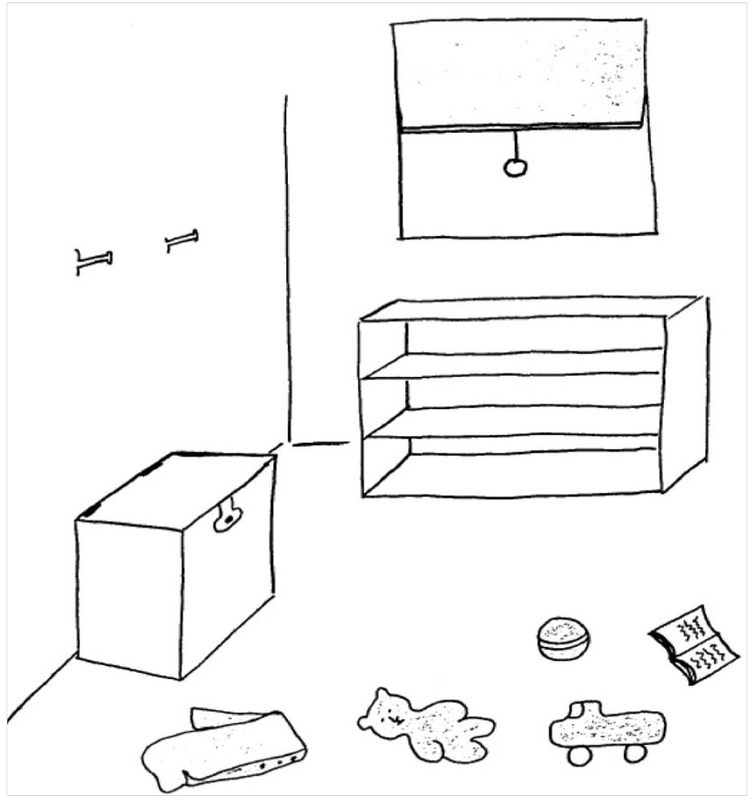 **Thank you to Nancy Roberts for sharing these messy room-clean room drawings. 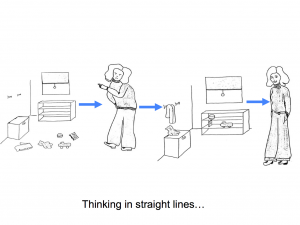 This entry was posted on Monday, June 1st, 2015 at 10:33 am	and is filed under "Systems thinking for kids", Closed loops, Seeing Systems. You can follow any responses to this entry through the RSS 2.0 feed. You can leave a response, or trackback from your own site.